Born in New Orleans in 1957, I've spent most of my life in Shreveport, LA. Our family would make frequent trips to the Ouachita Mountains where all this began. I moved to Murfreesboro in 1999 to perfect my craft and learn almost all I could about my favorite water - "home" water as people like to say! In the fall of 2014, with my lovely bride, Sandy (that's her in the water with fish on! ), now retired and able to spend more time together in our "later" years, I moved back to The Port and now base out of the house instead of an apartment in The Boro! Prior to getting into the actual business of Fly Fishing, I spent quite a few years playing music for a living (and occasionally still play some blues when I get so inclined). I then spent a few years as a Tennis Pro, learning to teach and translate physical aspects into words. It's a priority to make sure people can understand what they are actually trying to accomplish. By the way, I have gotten re-involved in tennis both back in Murfreesboro and once again here in Shreveport! I am now also the Tennis Pro for the Christus Athleltic Club in Shreveport! 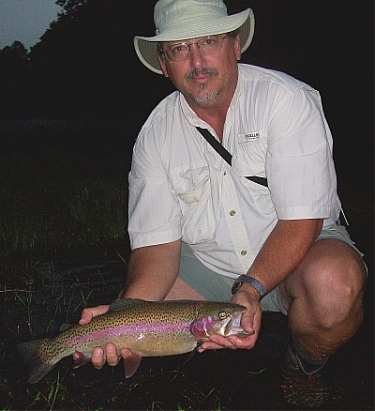 I have been wading around the Little Missouri and other Ouachita Mountain streams since about 1970, where I began to learn some of what I know about fly fishing. 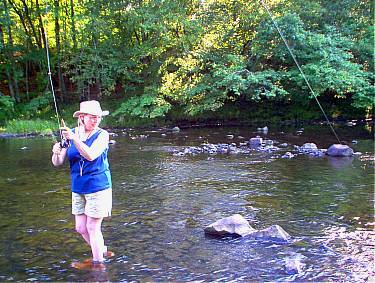 Much of my time early on was spent fishing for the sunfish, smallmouth and trout of the Little Missouri, the Caddo, Blaylock Creek and Long Creek. The education continues every day. In 1984, four fellow Fly Fishers and I founded the North Louisiana Fly Fishers, the first Fly Fishing club in Louisiana. I am honored to have served as NLFF President and held other offices, including newsletter editor, from the group’s inception until March 2000. Over the years, I have been invited to present clinics and programs on Fly Casting, Fly Tying and other aspects of the game to many Fly Fishing Clubs around Louisiana, Texas and Arkansas. On several occasions I have also been a Demonstration Fly Tier and Program Presenter at the Southern Council Conclave of the Federation of Fly Fishers . I have conducted numerous one day schools and taught extensive Fly Fishing classes for Bossier Community College and LSU-Shreveport. The number of casting lessons with individuals escapes me. 1989 saw the opening of Clearwaters Rod and Fly, the first Fly Fishing "only" shop in Louisiana. After 10 years as shop owner, I finally decided to move to Murfreesboro and the Little Missouri River. Guiding Fly Fishers and teaching those who are just getting started or want to learn more is now my primary interest. Many guides just show you where the fish are. Almost anyone can do that! My goal is for you to know why the fish act the way they do and what they're hungry for. I take great pride in seeing my students improve their Fly Casting, be it from scratch or fine tuning someone with experience. Just being able to say, "I know when the cast is right because it feels good" means nothing. That you know why Fly Casting works the way it does, recognize casting problems, and be able to solve them on your own, is critical to me. At least half of my clients have never touched a Fly Rod, much less fished moving water, and my repeat customers make me especially proud. They let me know I’m doing something right and they're learning more and more about fly fishing. I hope you choose to come to The Little Mo' and take advantage of the great fishing in this beautiful area of Southwest Arkansas. I especially hope you will decide to spend some time fishing with yours truly. I won’t guarantee that you'll catch fish - I’d be an idiot to do that, but I suspect that you probably will. I know you'll learn something new and have a good trip one way or another.